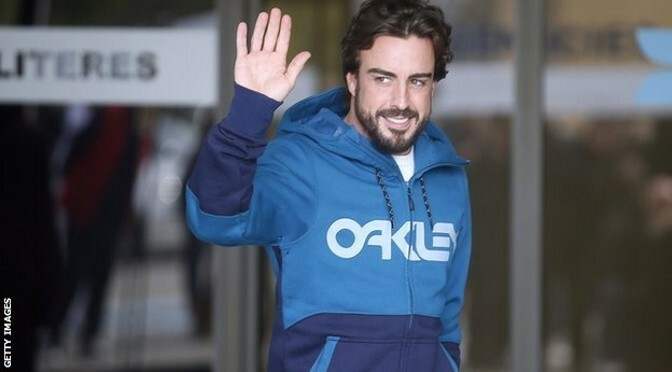 Fernando Alonso has left hospital following treatment for concussion but will sit out of this week’s final pre-season test as he continues to recuperate. 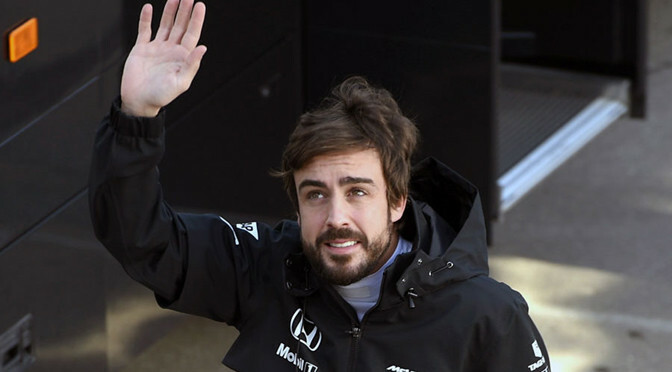 Alonso spent three nights in the Hospital General de Catalunya following an unusual but nasty accident at the Circuit de Catalunya during testing on Sunday. He has now returned to his family’s home in Oviedo and will be replaced by Kevin Magnussen at this week’s test. 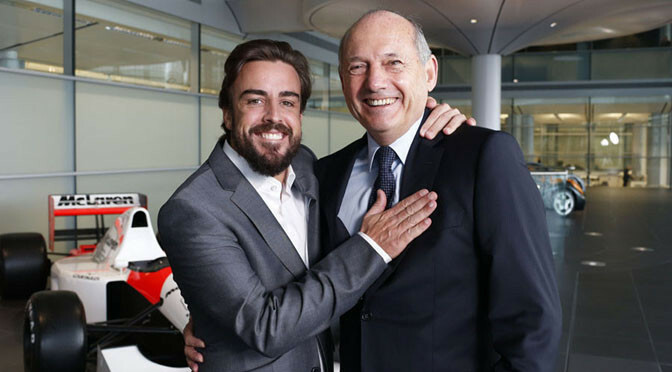 “Following his testing accident at the Circuit de Barcelona-Catalunya last Sunday, we are pleased to confirm that Fernando Alonso has now left hospital,” a team statement said. “He has returned to his family’s home in Spain for further rest and recuperation. “As a result, he will sit out this week’s final winter test, at which he was due to share driving duties with Jenson Button. Kevin Magnussen, McLaren-Honda’s test and reserve driver, will replace him. Earlier this week McLaren published the results of its investigation into the crash, revealing Alonso’s car was caught by a gust of wind in the fast right-hand Turn 3, causing him to run wide and lose control of the car. He then made heavy contact with the inside wall before making a further impacts with the wall before his car came to a halt ahead of Turn 4. 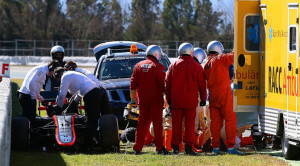 According to reports, the FIA will investigate the incident in attempt to learn from the accident. 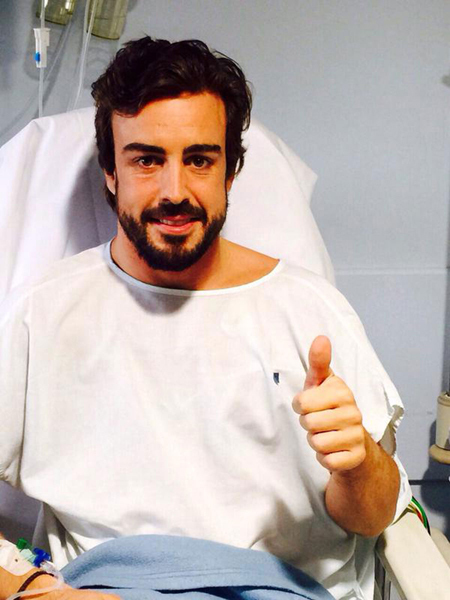 McLaren has clarified Fernando Alonso’s crash in Barcelona occurred due to unpredictable gusty winds at the circuit and confirmed the Spaniard is making a “solid recovery” in hospital. Alonso was airlifted to hospital on the final day of the second test for precautionary tests after suffering a concussion following a crash at the exit of Turn 3. After the crash speculative reports suggested Alonso had fainted or lost consciousness at the wheel before the accident due to the distance between initial contact with the wall and where he stopped, though this contradicted official statements from both the team and the Spaniard’s management. 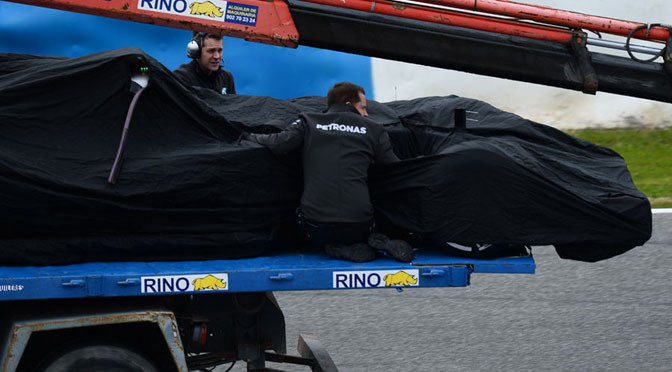 In a statement released on Monday McLaren categorically denied any electrical shock occurred inside the car and instead blamed the high winds at the circuit on Sunday, which later in the day caught out Alonso’s compatriot Carlos Sainz at the same part of the circuit. McLaren also confirmed Alonso had been applying full brakes before impact with the wall. “Over the past 24 hours, we have been carrying out a detailed analysis of the damage to Fernando’s car, and its associated telemetry data, in order fully to understand the cause, or causes, of his accident,” the statement said. “Even at this early stage, we have been able to reach some firm conclusions. “His car ran wide at the entry to Turn 3 – which is a fast uphill right-hander – allowing it to run onto the Astroturf that lines the outside of the track. A consequent loss of traction caused a degree of instability, spitting it back towards the inside of the circuit, where it regained traction and struck the wall side-on. Our findings indicate that the accident was caused by the unpredictably gusty winds at that part of the circuit at that time, and which had affected other drivers similarly (eg, Carlos Sainz Jnr). “We can categorically state that there is no evidence that indicates that Fernando’s car suffered mechanical failure of any kind. We can also confirm that absolutely no loss of aerodynamic pressure was recorded, which fact indicates that the car did not suffer any aerodynamic loss, despite the fact that it was subjected to a significant level of g-force. Finally, we can also disclose that no electrical discharge or irregularity of any kind occurred in the car’s ERS system, either before, during or after the incident. 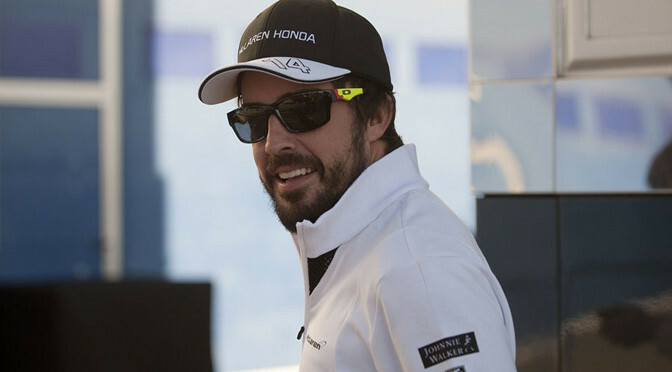 Alonso, who suffered a concussion in the crash, was taken to hospital as a precaution after his crash and McLaren is yet to make a decision on his involvement in the final Barcelona test which begins on Thursday. 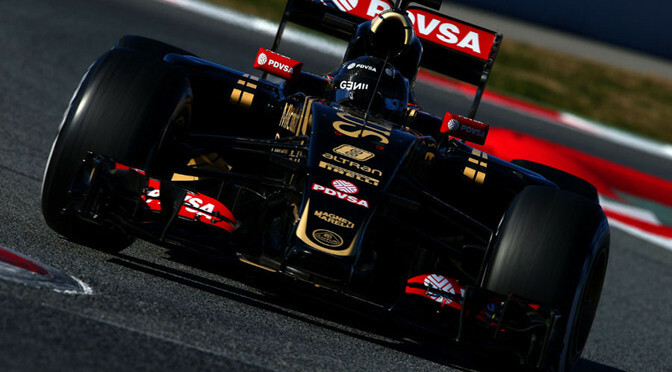 Romain Grosjean made it three out of four for Lotus at this week’s pre-season test in Barcelona as he topped an eventful day marked by Fernando Alonso’s unusual crash in the McLaren. Half an hour before lunch, Alonso went off the circuit at the exit of Turn 3 and came to a stop on the run down to Turn 4. A lengthy delay followed and after being taken by ambulance to the medical centre a conscious Alonso was airlifted to hospital for precautionary checks. CT scans in the afternoon confirmed the Spaniard was uninjured, although he will be kept in hospital overnight. 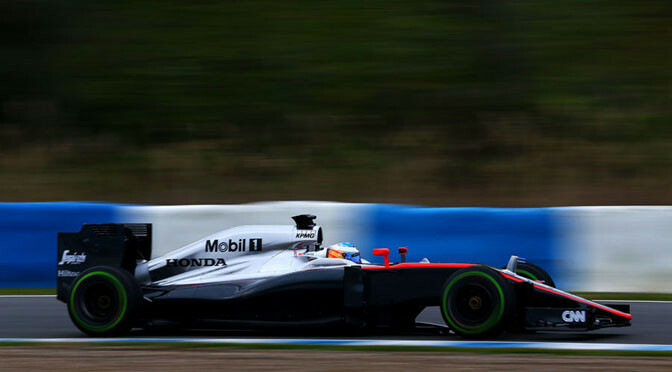 Alonso completed just 19 laps before his accident and McLaren was not able to get the car back out on track in the afternoon when Jenson Button was scheduled to drive. It means McLaren finishes the second pre-season test with just 129 laps to show for its week in Barcelona and just one week of testing left to rectify its problems before the first race in Australia. Alonso’s accident was just one incident in an eventful final day at the Circuit de Catalunya, which saw four further red flags in the afternoon. First Nico Hulkenberg stopped on track under a cloud of smoke from his 2014 Force India. 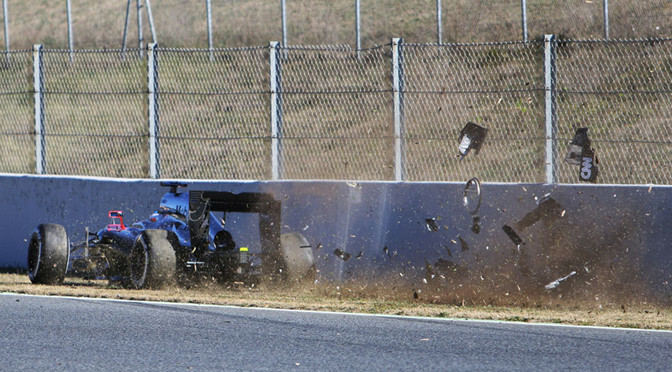 Carlos Sainz then spun off at Turn 4, snapping the Toro Rosso’s front wing on impact with the wall. The accident was heavy enough for him to have to pay a brief but routine trip to the medical centre for checks. Valtteri Bottas stopped in the same spot a few moments after the green flags came out and with ten minutes to go there was another red flag when Felipe Nasr pulled up with a problem with his Sauber. Grosjean’s headline time of 1:24.067 was set on the super-soft tyre, and marked a day with 111 laps and a race simulation for Lotus. Mercedes added to its sizeable winter mileage count with 131 laps for Nico Rosberg as it continues to look for a step forward in reliability this season. In the final hour Rosberg put in an impressive 1:24.321, set on the medium tyre and just 0.254s off Grosjean’s time. The lap was roughly a second faster than Lewis Hamilton’s pole position time on medium tyres at last year’s Spanish Grand Prix, but unlike Hamilton’s was set on used tyres and most likely with a heavier fuel load. After focusing on pit stops and race starts on Saturday, Williams spent the day focused on longer runs. Valtteri Bottas started a race simulation after lunch but it was interrupted by a visit to the Williams garage and Hulkenberg’s stoppage. He then continued the long run before stopping at Turn 4 himself, though it did not end his day. It was obvious Williams was not chasing times and his race simulation and 129 laps was an impressive way to round off the second test. Sebastian Vettel’s second day this week in the Ferrari garnered a solid 76-lap haul, though his day was punctuated by several long spells in the garage. 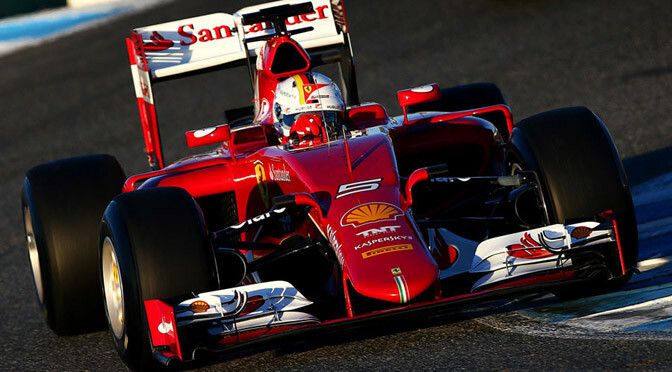 Ferrari still has plenty of reasons to be optimistic after eight solid days of testing so far. 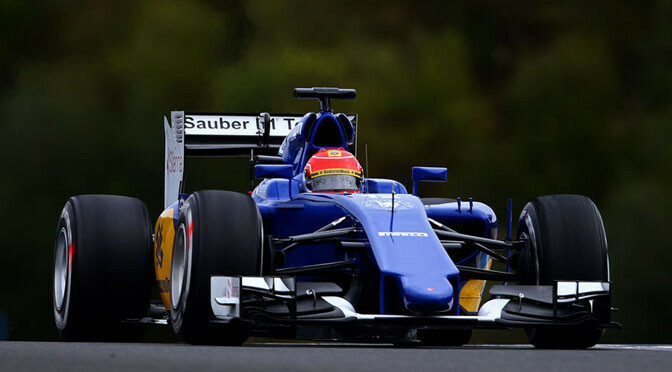 Felipe Nasr’s day was blighted by an early pit-lane stoppage which kept him in the garage for an extended period before lunch, though he did recover to record 73 laps. 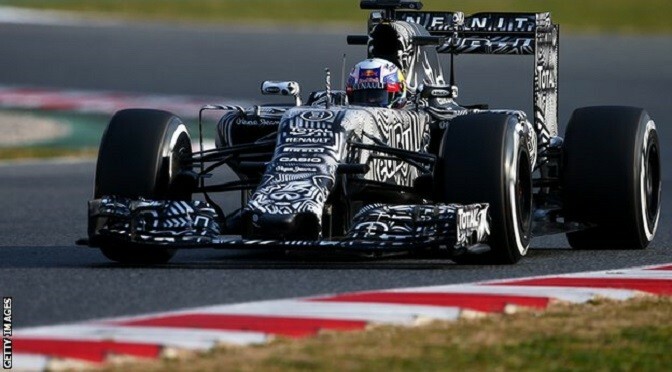 Sainz’s spin ended his day after 88 laps, while Hulkenberg finished his first F1 run of the year with 36 laps. Force India hopes to arrive at the third test with this season’s challenger but will have gained valuable 2015 tyre data from this week’s test. 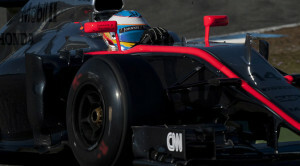 Racing director Eric Boullier said McLaren’s 32 laps on Tuesday were a “huge relief” after tracking down and fixing the problem that kept the team from running more than 12 laps on the first two days of testing in Jerez. Even though the day was stopped short when a water leak popped up and forced the team to remove the Honda engine, Boullier said McLaren counted Tuesday’s efforts as progress. The team is expecting to be running again on Wednesday morning. Boullier said McLaren could have got the car back out on track at the end of the day but the team decided to focus its efforts on Wednesday. However, to give an indication of how far behind McLaren is at this stage, Boullier said the team had completed less than 50% of its target for this test.